When young players break through and score a ton of goals it’s easy to take a look at their goal to shot rates and be cynical. In fact, unless you are Ronaldo, it’s likely that any season of high goal volume will be accompanied by a tasty conversion rate. In the course of my pondering, I came to look at young players who had scored a good volume of goals: specifically players who at the age of 21 or under had finished a season with 15 or more non-penalty goals. Now each of these players converted their shots at a rate high above league averages of around 9-10%, as you might expect for forwards – between 14% and 23% (Drmic) and each converted their shots on target at a similarly high level- 33 to 43% compared to an average of ~30%. The higher end of these rates are obvious warning signs: that a player has scored a volume of goals is inevitably impressive and inflates their perceived reputation, but largely, aspects of the method are likely unrepeatable. Of the five, three have been sold for large transfer fees, Lamela for around £30m, Lukaku for a shade less and El Shaarawy was bought by Milan for 20 million Euros. Kane’s value, at this moment, is out of the range of any club on the planet, particularly Man Utd. Ahem. So I got to thinking: both the higher fees here were paid for left footed players and that chimed with some research I put together some while back about foot prevalence in football. Taking a sharp turn, that’s where we now head. …the majority (…) are right-footed (60%); 22% are left-footed players and only 18% of the players in the five leagues are equally strong with both feet. The classification of players is undertaken by external experts who assess players based on observation of matches. Then: Carey et al., “Footedness in world soccer: an analysis of France ’98” (2001), a study that decided two-footedness was far less prevalent, around 1%, with decidedly stricter criteria. Interestingly here, the disappearing 17% landed entirely on the right footed side leading to a general 80:20 split. There is also this blog that discusses the two papers in a lighter manner. The blog is labelled “Part 1” and sadly it appears part two never came to fruition. Each study and the less heavyweight comparison blog are worth your perusal. And as far as I can tell there is little else. I went about this a little differently given that I am not an academic team and am aware of the limitations of my source material- WhoScored to be precise- but many months ago I started collecting shot and goal information and the foot used therein about higher volume shooters in the top leagues. Initially I collected 100 players from the Premier League in 2013-14. Then some interesting players figured in the next 20 slots so I collected them too. And then I repeated the task for preceding seasons and then for other major European Leagues. 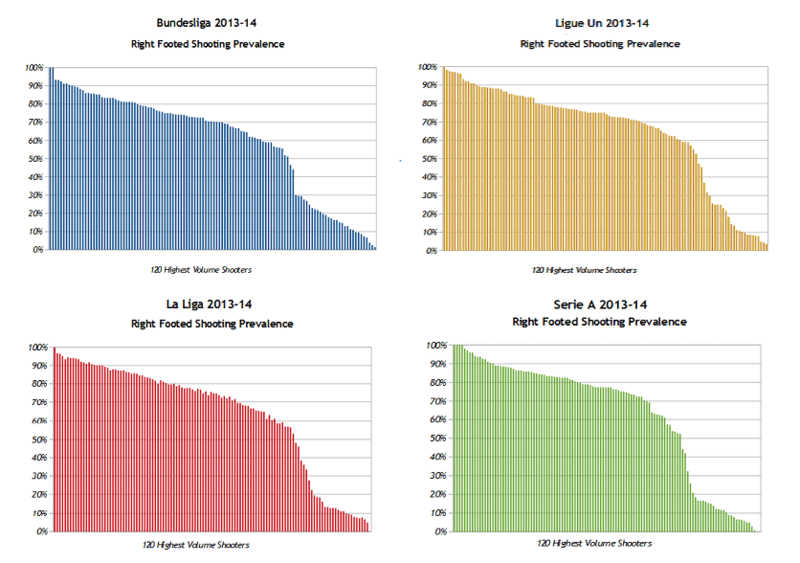 I had to create a cut-off point somewhere and there seemed a little logic here, being a shooting chart, 120 players would likely collect somewhere around the 5 to 8 highest volume shooters per team: the main contributors, mostly midfielders and forwards. Call it a labour of love, call it a pain in the arse or whatever, I did it because I was interested to and I eventually ended up with 3000 player seasons to prod and poke at. Now anyone who has collected shot and goal data will tell you that that’s only half the job: next you need to throw out penalties, as they skew results and do not offer a helpful representation of general play; they are an entirely separate skill. 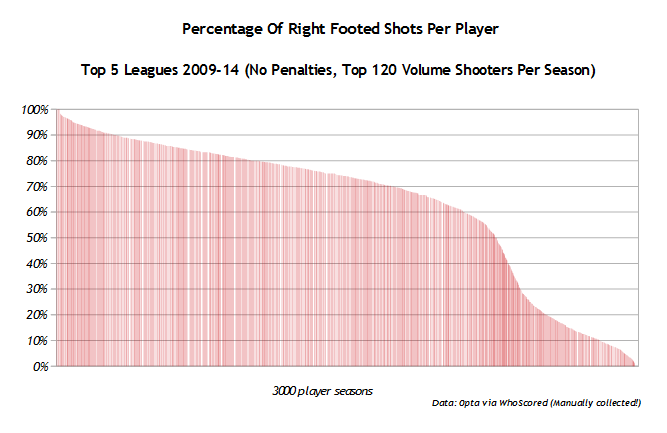 The vast majority of penalties were easy to strip out, as the taker showed a clear predominance in the data for one foot. A very small element of this section was subject to my interpretation, it was an inevitable problem that needed to be solved. So penalties? Out they went. And then I had to pull away the headers and finally split the shots into two categories. By this point it was getting pretty frosty down in hell, so I figured I should look a little at the data. Ain’t that a pretty curve? If we’re looking for differences, the Bryson paper suggested that there were higher rates of two-footed and left footed players in the Bundesliga and there is a subtle difference in the shape of its graph here; the trend is very similar but the tail of left footers is noticably longer. What is encouraging here is the definition of left footed players. In my sample it lands at a shade over 20% for each of the three suggested definitions, very similar to the overall sample observed by the Bryson survey. With a predominance of attacking players in my sample, it could be theorised that a definition should be specified towards the higher end, but that remains to be seen. As a follow on to the coherence in the left footer definition we find a grey area between right footed and two footed, something which reflects back on the different definitions from the two earlier surveys. Depending on where you peg the dominant percentage, the two groups fuel and supply each other. 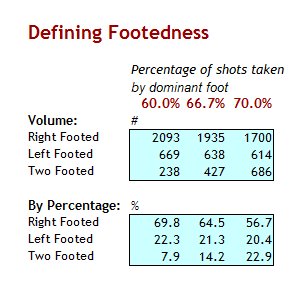 And we can see that 80:20 holds but more strongly as a definition between Right/Two-footed and Left footed. Anyway, I have other theories i’ve pondered or examined over months-left footers are more left footed than right footers are right footed is just one- but hopefully, this post will create a bit of interest in what I feel is an underdeveloped aspect of using the data. There are possible implications for expected goals modelling too as people strive towards improving work here. And there are also factors around conversion rates that merit discussion but are beyond the remit of this initial post. I appreciate that people may look in and instantly see different (better?) methods of examining this subject but i’ve attempted to work to create an accessible point to start from and provoke thought. Cherish those lefties, for they are few.